Alright, first order of business, we are going to refer to this series as Bunny Girl Senpai because the title is just too long! You may remember from my first look at the Fall 2018 season that this anime was high up on my list of shows I wanted to keep up with each week. I didn’t say much then, but the big point was that I liked the dialog and dry sense of wit. In this way, Bunny Girl Senpai did not disappoint! However, by its end, I wasn’t as hot on the show as I would have otherwise expected. 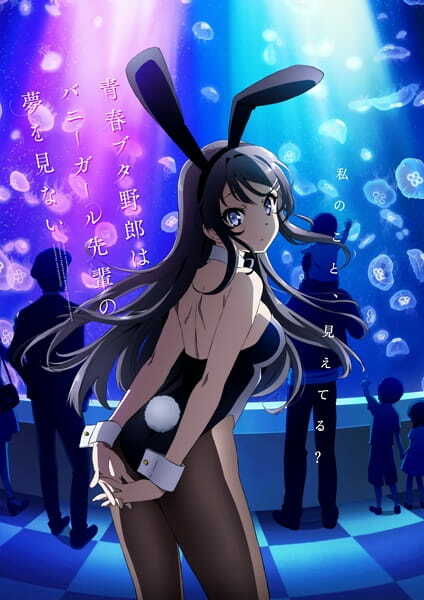 Some background for folks, Bunny Girl Senpai is yet another light novel adaptation that is somewhat reminiscent of franchises such as Haruhi and Monogatari. Except, it really isn’t too much like either of those series, but you are going to see this compared to them quite a bit. This isn’t a bad thing, and in some ways this is warranted. 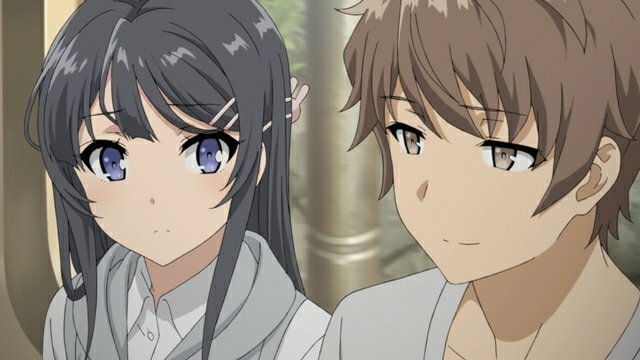 In Bunny Girl Senpai the main character, Sakuta, is a sarcastic guy, much like Kyon. He goes around helping various girls with various supernatural hangups, which is where the Monogatari comparisons come in. Though, at the end of the day, it is very much its own beast that isn’t quite at the level of either of the other series. This isn’t a mark against Bunny Girl Senpai, but if you are going in expecting either, you’ll be left disappointed. What really surprised most folks, and I’m included in this, is that the first arc feels like a big climax that would normally be reserved for the end of any other series. You get to have the relationship resolved between Sakuta and Mai, as well as the supernatural hangup. There is still plenty of room for more story and places to go from here, so the 13 episodes aren’t wasted. Sakuta and Mai have great chemistry. When it comes to the other characters though… they just aren’t as interesting. The only character I really liked other than these two was Kaede. It wasn’t that their stories were disinteresting, I still enjoyed them, but I didn’t quite care as much. This reminds me of Kanon 2006 where the show has a HUGE emotional climax for its first arc (more so in this specific show than Bunny Girl Senapi) which diminished the proceeding arcs. It still recovered by the end, sure, but Bunny Girl Senpai felt similar to me in this way. Back to Kaede, I was actually looking forward to her arc, and up until the final episodes, I was really enjoyed it. Then the show just didn’t land for me. The ending felt too loose, like it didn’t really wrap things up. It did, but it didn’t at the same time. If you’ve seen this maybe you feel the same way, but I really don’t have a better way to explain it than that. With all that, it probably sounds like I didn’t really like this show much, however, this isn’t the case. If anything, I’m just disappointed that I didn’t enjoy it more. What should have been a high-point of the season for me, ultimately only managed to be an interesting footnote in a season with a lot of hit-or-miss content. Worth the watch, but Bunny Girl Senpai isn’t the modern classic it should have been. What are your thoughts on Bunny Girl Senpai? Be sure to share them with your fellow readers and me in the comments. If you enjoy my content then please consider a donation by clicking the button I have below, I’d really appreciate that. Thanks for taking the time to read and I hope to see you back here at Jon Spencer Reviews again soon! The show is really about the trauma and anxiety of teens growing up. Sakuto is the medium by which they come to grips. Each of the characters (Sakuto included) is experiencing a very real kind of anxiety that teens often feel. Their reactions are the kind of reactions that actually happen, only exaggerated and pushed into the supernatural. In truth, the pain those teens felt might not heal for many years – if then. They cut themselves, they avoid contact with others, withdraw into themselves, become obsessed with social standing, trade their bodies for affection and even commit suicide if they don’t measure up. It would be really boring if Sakuto were just a good therapist and talked everyone down from their respective ledges. Hence the supernatural aspect. The love story with Mai was necessary to keep it from turning into a serial harem. Since he is taken from the start, he’s “safe” for a girl to talk to. I got all that. Not really the focus of my critique of the show itself, more on the general structure. I still liked it. Understandable criticisms. The show started off way too strong for its own good. But even then, I’m a sucker for this kind of storytelling. It was still a good show, just needed a bit more something. Maybe the movie will fill that? Still that doesn’t magically fix the series itself. The big reason they failed to stick the landing was that it was pretty much “and now go see the movie” ending. (The moral equivalent of a “go read the manga” ending.) To fit this in, Kaede’s arc was… trimmed let’s say. In the end, I don’t feel the time I spent watching was wasted, and isn’t that what really matters? Sure, I don’t feel like I wasted my time either, but that doesn’t dismiss the problems that resulted with the choice of making the movie the (hopefully) big concussion. It left the show lacking. Not perfect, but that’s about the worst I can say about it! And the OP and (evolving!) ED were both a lot of fun. Always good to hear people enjoying shows 🙂 I just think this needed a bit more of something. Well, maybe the movie will handle that? Karandi was talking about it. You can read the news on it here though: https://otakumode.com/news/5ba0a1a0adfc90e459881e70/Seishun-Buta-Yarou-to-Get-Movie-in-2019! While I would have like a more resolved ending rather than what we got and a movie announcement, I really enjoyed watching Bunny Girl Senpai each week. I had a lot of fun with it and really enjoyed the characters and the dialogue. Certainly there were plot points that probably could have been better explored or written more tightly but this one was definitely worth the watch last season. Sure, maybe the movie will really bump this up overall. As it stands it was good, just not great like I thought it’d be.